When we saw Obama with Mandela’s family on TV, we were supposed to forget the CIA’s role in Mandela’s imprisonment on Robben Island. We were supposed to forget that heroic Mandela spent 27 years in an apartheid jail but remained on the U.S. terrorist list until 2008. The TV images implied a passing of the torch from Mandela to Obama. But can we compare the commander in chief of a country that promotes war and racism with a man who played a colossal role in toppling the horrors of apartheid? For decades U.S. imperialism blocked meaningful U.N. sanctions, even after the Sharpville massacre in 1960, when 69 were shot protesting pass laws. The impunity continued long after the murder of anti-apartheid leader Steven Biko and up to 1000 school children protesting the Afrikaans language in schools were mowed down in 1976. All the while, U.S. investments poured into apartheid South Africa, topping $1 billion. New York’s Chase Bank was a prominent investor. It took a massive campaign for Congress to finally override President Reagan’s veto, and to allow a weak congressional sanctions bill to pass. We are also supposed to forget how “democratic” Israel, itself an apartheid state, played its own sinister role as South Africa’s second largest trading partner and a source of weapons and military training in its dual role as a U.S. surrogate. South African Communist Party (SACP)—has passed the test of revolutionary leadership. As the leading economy in Africa, a socialist revolution would have had a massive impact on the continent and world politics. It would be an alternative to what we see with the kidnapping of school girls in Nigeria; people would shun groups like Baku Haram. A revolutionary government in South Africa would inspire revolutionary struggle, provide it with material aid, and give the masses an alternative to the World Bank starvation policies prevalent throughout Africa. Make no mistake, South Africa is a player in the world economy, seen as an “emerging country.” Decades of apartheid and its aftermath guaranteed a very high rate of profit in the mining of gold, platinum, diamonds, and other valuable resources. Manufacturing and the financial sector are also growing. Yet today, the share of wealth held by the Black majority is actually less than under racist apartheid. The term “class apartheid” best describes South Africa today. The failure of neo-liberal capitalism could not be more devastating than in South Africa, which is one of the most unequal societies on earth. • South Africa’s official unemployment rate stood at 16% in 1995 and rose to 30% in 2002. Adding discouraged workers to that number, the figure was 43%. • Average Black household income fell 19% from 1995 to 2000, while average white household income rose 15%. At the same time, primary corporate taxes dropped from 48% to 30% in 1999. • Half of South Africans earned just 9.7% of national income in 2000, down from 11.4% in 1995. The richest 20% earned 65% of all income. • In 2013, using the national poverty line of $43 a month, 47% of South Africans, mostly Black, remained poor. In 1994, this figure was 45.6%. Adding to those outrages is the $25 billion debt inherited from the apartheid regime and assumed by the ANC government. Moreover, the ANC refused to press for reparations from the corporations that profited from apartheid. And the ANC agreed not to prosecute apartheid murderers after the findings of its own “Truth and Reconciliation Commission.” Compare that to the aftermath of the post-World War II Nuremberg trials, when several Nazis were hung! What is interesting is that the capitalist class actually came to realize that apartheid was an impediment to economic growth—that is, profits. Capitalists learned that, despite their racism, more Black workers were needed in towns instead of being banished to bantustans. Moreover, super-exploited Black workers, as well as “Coloureds” (mixed-race people) and “Indians,” could not afford to purchase a sufficient amount of South African-made goods for economic expansion (profits). In recognition of these realities, some corporate leaders signed an open letter in 1985 calling for full citizenship rights for “all our people.” Signers included mining interests like the giant Anglo-American and de Beers corporations, and also multi-nationals such as General Motors, Coca Cola, General Electric, and Toyota. Finally, mass mobilizations, sanctions, and international outrage at apartheid pushed these criminals to cut a deal with the ANC. At an early stage, they undertook negotiations with Mandela in his prison cell. The U.S., British and other imperialists engaged in direct talks with the ANC, with the Soviet Union as partners. The ANC was asked to give-up armed struggle, limit mass mobilizations, and step back from nationalizing the banks, as the ANC had promised in the Freedom Charter. One ANC top official told the Los Angeles Times as far back as 1988, “We are probably getting more pressure from Moscow to agree to negotiations than we do even from London or Washington today.” Soviet officials advised the ANC to go slow on implementing the Freedom Charter and to accept “monopoly capitalism” for many years. Joe Slovo, the Stalinist SACP leader in 1992 and one time head of the armed wing of the ANC, offered the key compromise of a “Sunset Clause,” to be included into the new South African constitution, which guaranteed that a white-Black coalition capitalist government would remain in power for at least five years. It was adopted, although the term “power-sharing” was removed. The impending collapse of the Soviet Union and the utter confusion of those educated by the politics of Stalinism drove these life-long sell-out reformists even further to the right. By 1991, Mandela reassured President Bush and U.S. corporate types that “our perspectives have changed” on the issue of nationalizing banks. “We chickened out,” admitted Ronnie Kasrils, ANC central committee member and one-time head of intelligence for the armed wing of the South African Communist Party. outh Africa followed a far different path than revolutionary Cuba. The corrupt capitalist state in Cuba was smashed, but not so in South Africa. All of the capitalist institutions remain intact in South Africa, including the capitalist police and army. A shock to the entire political system was the police/government/corporate massacre in August 2012 of 34 striking miners at the Lonmin mine in Marikana. Clumsy attempts by South African officials at a cover-up included planting weapons next to bodies. Incredibly, the workers themselves have been charged with murder. All of this is shown and more in an incredible film: http://www.minershotdown.co.za. ANC leader Cyril Ramphosa is on the board of the Lonmin mine and has an estimated wealth of $1 billion. He called strikers “criminals,” and even COSATU said much the same. The irony is that Ramphosa was once regarded as a militant miners’ union leader. The struggle did not take place in a vacuum. Six months earlier, scores were killed after 17,000 miners were fired nearby at the world’s second largest platinum mine, Impala platinum. The Marikana massacre itself was followed by a massive wave of wildcat strikes. What went wrong in South Africa? The post-apartheid South African tragedy was not a mistake. The ANC was not caught napping; nor has it merely succumbed to the temptations of power. No, there’s something more fundamental here. The ANC was heavily influenced by the SACP, which made the error of embracing capitalist rule as part of its acceptance of the strategy of so-called “two-stage democratic revolution.” This doctrine, which was developed under Stalin, views capitalist development as a “progressive” replacement for backward dictatorships. The socialist goal, workers’ power, is relegated to a distant future. The reformist Russian socialists of the early 20th century, called Mensheviks, held a similar view. Backward Tsarist Russia, they said, must go through an extended period of capitalism, which would grant democratic rights. The Mensheviks supported the liberal capitalist government of Alexander Kerensky after the fall of the Tsar. A version of the “two-stage democratic revolution” was used by Lenin in his early essay, “Two Tactics of Social Democracy in the Democratic Revolution,” as he strategized the tasks of workers and peasants in power. But Lenin discarded that vague formula in 1917 in his famous “April Thesis,” delivered on his return from exile. Lenin castigated the leadership of the old Bolshevik Party (Stalin, Kamenev, etc.) for supporting Kerensky. Why was Lenin angry? Because the capitalist system was already imperialist, globalized and deeply entangled with the Russian aristocracy. The capitalists became a reactionary force, as they are in South Africa and all over the world today. The revolutionary Lenin-Trotsky government, as it was known, declared “all power to the soviets,” the mass workers’ coalitions. After workers toppled the bourgeois Kerensky, they began to carry out the democratic tasks of the revolution, at the same time that they moved forward on socialist goals. This was Leon Trotsky’s famous “permanent revolution” in practice: There are no progressive capitalist governments anywhere—neither here in New York nor in Cape Town. Not in the age of imperialism. In the 1930s, the conservatized, privileged bureaucracy led by Stalin applied the “stagist” strategy worldwide. This retrograde strategy led to defeats and massacres in China and Spain, and later in Chile, Indonesia, and many other countries. The political landscape appears to be slowly changing in South Africa, with some promising developments. The South African national election, on May 9, resulted in sustained support for the ANC, with 62% of those voting, about the same as 1994, although significantly down in several urban centers. The center-right democratic alliance drew 22%. The new Economic Freedom Fighters (EFF), led by former ANC youth leader Julius Malema—who is facing corruption charges—won 6.4%. The EFF has demanded nationalization of the banks and the redistribution of land, as did the historic Freedom Charter. Their representatives appeared in parliament in red berets and red worker’s clothes. A significant development took place when the National Union of Metalworkers of South Africa, or NUMSA, declared last December that they are splitting from the ANC alliance. They have vowed to form a workers’ party (“United Front and Movement for Socialism“) that might run candidates in 2016, but they sat out any role in the last election. Their leading spokespersons, like General Secretary Irwin Jim, claim to be Marxists and call for the nationalization of resources. Jim has spoken to the formation of a “united front” of class struggle and the building of a “movement for socialism.” NUMSA has said that its break with the ANC is “irreversable.” If this union, with its 340,000 workers, pursues a genuinely class-struggle movement, then it will be a development of world importance. With few exceptions, the leaders of the working class throughout the world come as beggars to the capitalists’ table. Without revolutionary leadership, the workers’ movement will remain beggars. 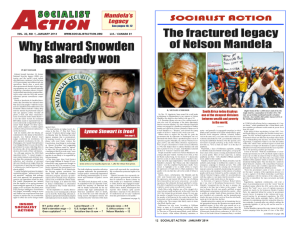 This article contains the major portions of a talk by Socialist Action member Marty Goodman at a panel discussion, “The Mandela Legacy,” sponsored by Socialist Action at the Left Forum in New York City, on May 31. Other speakers on the panel included Nellie Bailey, Marsha Coleman-Adebayo, and Margaret Kimberly from Black Agenda Report. Photo: Strikers at the Lonmin platinum mine in Marikana, South Africa, where police massacred 34 workers in August 2012. June 8, 2014 in Africa, Black Liberation, International, Marxist Theory & History.